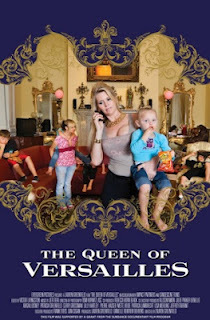 THE QUEEN OF VERSAILLES says everything that needs saying about the cycle of greed between consumers and banks that collapsed with the Global Financial Crisis. And it does so not by interviewing Wall Street bankers and earnestly explaining the securitisation market, but by taking us into the stupendously large home of the Siegler family, whose fortunes were magnificently swept up in the boom bust cycle. Papa Siegler was the king of timeshare. Credit fuelled his business at every level. Poor American families bought his units on credit -subprime credit as it turns out - and he in turn used the massive revenues he was generating to build ever more resorts and build ever more palatial houses. The lines between business and personal wealth were blurred. He mortgaged the gigantic Versailles house - the biggest house in America as it turns out - and ploughed the money into building a timeshare tower in Vegas. And when the credit cycle burst, he found himself in dire straits. Papa Siegler comes across as a stern, hard-ball businessman: tenacious, clever, hubristic at the start, and bloodied but unbowed at the end. His self awareness about the opiate of cheap finance does him credit. He is prickly, but sympathetic. But the really fascinating character is his second wife, a college educated girl who became a beauty queen, and married this man, thirty years her senior. With her plastic body and botoxed face, her seeming inability to curb her spending, and her lackadaisical approach to household management, Jackie would be easy to mock. But it's a tribute to director Lauren Greenfield that Jackie is not caricatured through editing but is allowed to come across as a sympathetic character. She seems to genuinely care about her friends and neighbours getting foreclosed upon, and to be genuinely worried about her stressed out husband. She loves the good life, but she's willing to stick by her husband for better or for worse. What I love about this documentary is that it shows you the morbid excess of consumerism -especially when put it in contrast with the lives of the Filipino nanny - but it also shows you how these people aren't bad people. It's hard to get perspective on the whirlwind when you're in it. To me, this movie is the flip side of the brilliant MARGIN CALL, which made a similar case for empathising with the Wall Street bankers who were running on the same hamster wheel of greed as the sub prime borrowers. We were all drinking the same Kool aid. THE QUEEN OF VERSAILLES played Sundance and Sundance London 2012. It will be released in the USA on 6th July 2012.